The Trolleybus Museum at Sandtoft organised an amazing transport Extravaganza to mark its 40th anniversary over the Spring Bank Holiday 2009. The BTS, having been involved at Sandtoft since day one, was proud to support this event and out of 16 operational trolleybuses used each day, 5 were BTS vehicles. 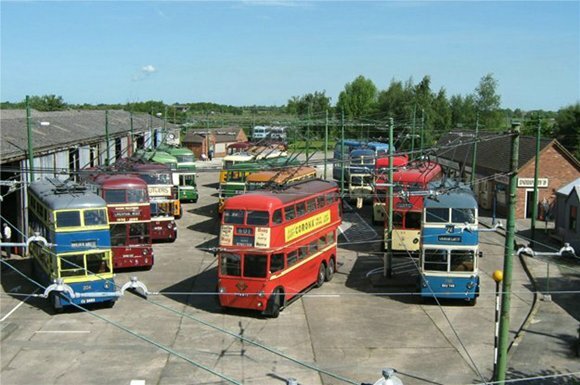 The photo above shows the 16 trolleybuses, representing 10 different systems, lined up before the museum opened to the public on Bank Holiday Sunday. Two of the BTS vehicles, South Shields 204 and London 1812 can be seen at the front of the left and middle rows. Operating 16 trolleybuses in one day is a record for the museum and congratulations are due to everyone involved for their contribution in making it such a memorable weekend.